Pianist Aki Rissanen (b. 1980 in Kuopio, Finland) has been quickly rising among the few top forces of the instrument in North European Jazz. Although originally classically trained he has always had a heart for improvised music. In addition to his high merits in the Solo Piano Competition at the Montreux Jazz Festival in Switzerland and La Defense competition in France, Rissanen is best known for his works with Dave Liebman on German Ozella Music and Verneri Pohjola on British Edition Records and on ACT Music in Germany. He has shared the stage with UMO Jazz Orchestra, Dave Liebman, Rick Margitza, Randy Brecker, Mats Gustafsson, Sten Sandell, Ingrid Jensen, Michael Gibbs, Barry Guy, Daniel Humair, Bill Watrous, Jukka Perko, Jukkis Uotila, Eero Koivistoinen and Ulf Krokfors. Under his own name he has released 9 albums and is currently gaining growing reputation on the European jazz scene. His album "Amorandom" (Edition Records 2016) made it to many best-of-2016 lists, including Argonauta Magazine (IT), Observador Magazine (POR), Distritojazz (ES), Jazzpossu (FI), Music Finland (FI), Valon kuvia (FI), was described as ‘the jazz album of the year’ in Helsing´s Sanomat and finally won the prestigious Finnish Emma Award as "Best Finnish jazz album in 2016". 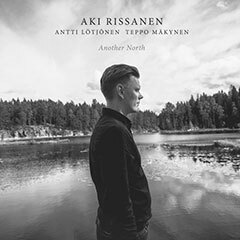 In November 2017 Aki Rissanen has delivered with "Another North" an all-encompassing, powerful new album, an album that explores new heights of rhythmic intensity, pulsating grooves and hypnotic loops, and so reset his compass and marked his trio as firmly rooted in the European modern jazz tradition. Aki leads his trio with Antti Lötjönen (bass) and Teppo Mäkynen (drums) and a side project of this trio featuring Petri Ruikka on visuals. He has performed on numerous international festival stages, such as the jazz festivals in London, Hamburg (Elbjazz), in Dudelange/Luxembourg (Like a Jazz Machine), in Saarbrücken (Jazz-Herbst) and JazzGAP/Garmisch-Partenkirchen, in Sofia, Tallin (Estland) and in the renowned Finnish festivals in Helsinki, Espoo, Tampere und Pori. By the jury of Bremen´s Jazzahead conference 2017 the Aki Rissanen Trio was selected for the Finnish Night and was one of the bands to present his country.